Finals are finally here, we have the Roos with their second bye so should have pretty full squads to choose from with only Boomer, Petrie and maybe Rawlings missing. However, there will always be one position that you need to trust a 50:50 player, and now that we are in the finals, this is more important than ever. So we reach round 21, the finals, and a week that I have been looking forward to for quite some time as I am making my way to Melbourne with some mates to catch 3 games of footy (Stk v Coll, Haw v PtA, Rich v Syd), it will be odd not jumping up to the computer at every quarter break in a game to see how the scores are or checking who is still left to play and where I might have the advantage over my opponent, but the Ice Cold Boags that I will be downing with my mates will make up for that and hopefully seeing some great footy live will too. Last week we had a few spanners thrown in the works with General Soreness, Bad Form and a Dodgy Hammy affecting Enright, Sylvia and Ablett. All this on top of not having Matty Boyd due to the bye. Some of our players really surprised like Mzungu with his massive effort which certainly took me by surprise. On the other side of things a few disappointed too, I was surprised to see the score from Zmith being so low, just watch the Fri night line ups, he may end up being a late omission so make sure you have cover. Andy Otten is delivering some form that we all thought he had this year, problem is that most teams have already traded him out. Anyway, he has been sitting in the 60’s of late and this week the ball will spend a great deal of time down his end. Matthew Wright has shown some consistent output since the Crow’s last bye and scored his highest in 4 weeks with a 75 on the weekend. Nick Duigan has started to regain some form over the last two weeks with his scores now heading in the right direction. He had 84 against Melbourne, and this week he is at Patterson’s Playground and he will see a fair bit of the footy too so I expect something in the 80+ range for him. I predicted Krakouer to have a belter against Port, but the rain may have dampened that a little (like that one?). However, an 86 certainly wasn’t terrible. Last time he played the Saints, he only scored a 70, so I am not quite so bullish on him this week, it should be a tight game which may reduce his scoring from the 85+ we have been seeing from him. Another Pie that a sneaky 8110 teams have is Alex Fasolo, he has put together a very tidy70, 90 and 74 over the last 3 weeks, I guess the opposition tend to not worry about him as there are so many other good players to worry about on that Collingwood team. 3 guys that are pretty much a lock for all teams these days are Dyson Heppell, Tendai Mzungu and Nick Lower. Heppell just keeps going and I continue to be impressed by this guy’s scoring each week, he doesn’t waver much at all, infact he hast scored under 80 only once in the last 7 games. Mzungu has really shown the form we all hoped for at the start of the season of late, he has now an 83, 84 and 114 in the last 3 and now that he is back home again this week where he averages 87, I expect a score like that and more from him, particularly now as we hav heard that Mark Harvey says he will be playing in the midfield more. Lastly, Lower has really been a bit of a constant in most backlines this year. He lept back to the 90’s and I don’t see him scoring less than 80 this week either. Another docker to note is Zac Clarke who could be a very handy replacement for Zmith and Petrie this week, he has scored in the 90’s for his last 3 games and with Sandilands and Griffen out, I can’t see this scoring stopping. Allen Christensen shrugged off the previous weeks green vest and came out and ripped up another 113 this week. This kid will be on the top of a lot of DT shopping lists over the years to come, particularly when a few of hte older Cats start to retire. With the Cats playing Adelaide this week (arguably their 3rd soft target in 3 weeks) he should quite easily put together another ton. Our Gold Coast boys struggled a bit on Saturday, but doesn’t everyone that goes to Skilled these days? Danny Stanley was good with a 77. Not a bad return, not on his average, but not bad. When they played Brisbane last he racked up a measly 61 but I do expect bigger things from him this time round as his overall form is much better now. In that game David Swallow scored a 75, but like Stanley has been building since then. His 70 on the weekend was his worst for quite some time. Trent McKenziescored 80 pts on the weekend and has been hovering around the 60-90 range for a while now since his 122, so he seems to be now a solid contributor. I just don’t know what to do with Sam Iles every time I think he is starting to get some form he blows it. Let’s hope that this 44 on the weekend was a blip. He has been very solid other than that of late with scores in the 80+ range in 5 of his past 6. Breust, Bailey and Hale showed good form at Hawk Park on Saturday, but not as good as Isaac Smith who followed Tom Rockliff by having a high scoring game after a DT Talk Interview. His 95 was his best score in 6 weeks and against the Power on Saturday he should eclipse that. Sam Reid from Sydney has been ok after having a dip in scoring recently. He scored 80 on the weekend and the Swans play Richmond this week and as a result I think he should do fairly well after his 66 against the Tigers at the SCG in round 12. Another guy that has had a bit of a dip in scores, but mostly this is because of his team sucking over the last few weeks is Stefan Martin. He has had a 56 and 66 over the last two weeks after 3 tons and 2 90’s in his previous 5 games. He has the Eagles this week and I think he should bounce back. Haven’t the West Coast really had a year out of the box after winning the wooden spoon last year (gee hope my team can follow this trend next year). Andrew Gaff was pick 3 in the Draft and one of the picks of my dream team this year, I still have him too, but over the last 4 weeks he has had 104, 58, 119 and 86. Not a bad effort! And this week he is playing at Etihad again, his two 100’s have both come at Etihad against St Kilda and the Dogs. Against Melbourne he should have a day out! Teammate Jack Darling has realy pulled himself out of the sh*theap over the last two weeks. He has had 88 and 99 in the last two, personally I think he paid Coxy to ping Kennedy in the eye. If Kennedy is back for a full game Darling will see his scoring drop, so watch out on Fri night to see how the team lines up. Some teams I have seen of late have been playing Daniel Talia and Brodie Smith, my advice… Don’t! I haven’t seen enough consistency with these guys. They are up and down and against Geelong this week they will be outclassed and I think they will score fairly poorly. I have been on the Patrick Karnezis bandwagon of late, but his 29 on the weekend against a fairly ordinary side worries me. Perhaps he is just keeping his price down for us next year. Sam Sheldon popped back up with another good score, but he has had the yo-yo syndrome this year, so stay off for now. I have dropped Stewart Crameri to this half of the list this week, as his scores over the last 3 weeks have been in alarming decline. He has had a run of 85, 66 and 49. Certainly not what we have come to expect from him recently and perhaps he may be feeling the effects of a long season where he has already played 18 games (one less than Heppell). Thomas Lynch continued his let down in form this year with a 53, hoever, this is his best in his last 6 games which is disappointing after his start to the year. Jeremy Howe is still a little up and down for me. His form line reads 105, 39, 70, green21, 83, 42 and 67. Certainly no consistency there and hence, I wouldn’t play him. Dan Nicholson and Luke Tapscott are in the same boat, guys I just wouldn’t trust at Melbourne at the moment. Matthew Lobbe is another that I just couldn’t let you play this week. He had 73 in the wet, but his form is a bit up and down at the moment and up against Bailey and Hale I think he might struggle this week. Same goes for Ben Jacobs, I think he might not do too brilliantly, if he even gets a full game. I only put Luke Dahlhaus down in this section because he is coming off the bye, I just am not confident on how he will go. He had a 58 last game which was his lowest in his last 3. Well there you have it, a hell of a lot of players some winners, some duds. One of the things to remember is that when looking at what these guys scored against their opponents earlier this year be careful as for many of them they had played about 10 games less than what they have now. Good luck in your first week of finals this week, hope you all get the bye next week so you don’t have to dump your Geelong players and see you all at the footy! Twitter me @pkd73 for your last minute help on Fri avo! Cannot decide who to bench out of Higgins, I Smith, Rioli, and Sylvia. A nice problem to have really, but can’t work it out. A must win this week for me, two very similar teams. Might be the decision that wins it. Wanting to trade up on either Swallow or Krakouer to Rockliff. Basically weighing up Swallow’s (potential) higher scores and decent form vs. Krakouer’s good form and DPP flexibility. I’m also worried Krakouer might get rested at some point. Do it. The Rock is on fire. Ok – my rucks are Sandilands, Cox, Lobbe (emergency) and Z Smith. I am concerned that Sandilands and Cox might both be late withdrawals which would leave me with just Lobbe flying the flag. Would you punt on Cox and Sandilands playing? Or take a safe option – eg upgrade Z Smith to Jolly for protection (only cost $30K)? I’d hate to waste a trade for no reason, but I do have 6 left. 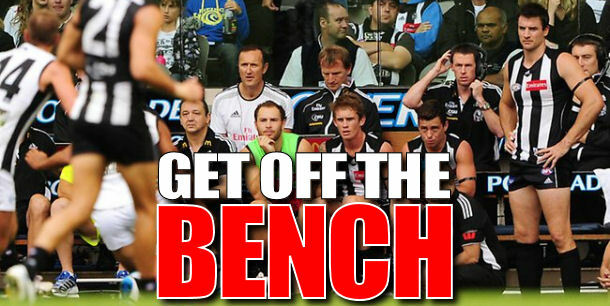 I want McEvoy but that will give me 5 St Kilda starters, and if the get flogged by the Pie’s it could kill my weekend. Secondly i need to make up 8 tips, in the final few rounds…..Are the Saints a decent shot for upset of the round? alex rance, nick duigan or andy otten to fill my last defender spot? I have a big dilemma in my fwd line. atm it stands at pay, chappy, buddy, roo, goodes, sylvia, isaac smith (didak, roo, lynch). i also have mzungu in the mids which i can DPP with didak. was looking at bringing in o’keefe for gu and playing rok as my 7th forward over smith. but now that i think about it, I’m tempted to play smith as well over volt against collingwood or sylvia coming back form VFL. didak or mzungu to start?? Whats fyfe’s last score againt carlton? Thinking of bringing him in this week as its elimination for me. Have to choose between I.Smith and Mzungu to start as they are both Dpp’s and unfortunately only one can make the team for me……Seems a common dilemma !! Which 2 out of Higgins, Gu and Sylvia? Leaning towards Gu and Sylvia. Didak’s the sub so not him. I’m going Smith against Port at the ‘G ahead of Gu against Carlton. lol pasted twice madtrader, ill give you my two cents worth…play adcock over heppell, he is captain of brisbane lions now that jonno is out for the season and will step up to lead the lions to victory over the suns, guaranteed tonnage! Firstly, Are my subs and general lineup right this week? Also, is Peter Faulks worth a look? Will he play or would it be just as good to go to an 80K rookie?